This code began it's life in a macro that created a list of Meeting Attendees and Responses. With a few tweaks, the macro creates a new email message addressed to the invitees who have not yet responded. This can be tweaked to send messages addressed to those who accepted, are tentative, or declined by changing the 0 in this line: If objAttendees(x).MeetingResponseStatus = 0 Then to the constant representing another response type. Get the GetCurrentItem function from Outlook VBA: work with open item or selected item and paste it at the end of the module. If location and attendees fields are not picked up when the macro runs against a selected meeting, open the meeting and run it. 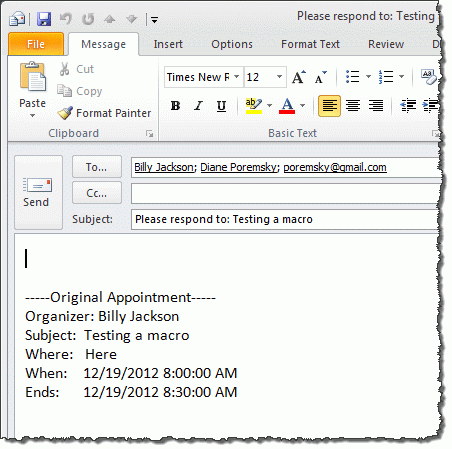 To use, select a meeting on the calendar or open a meeting and run the macro. A new message will open, addressed to all invitees (required, optional, or resource) that has not yet responded. The organizer is not included in the message. 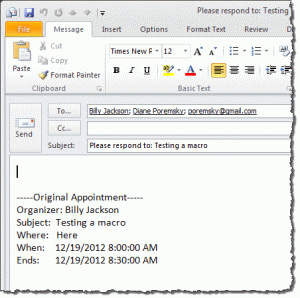 This macro works with either the selected item or opened item, using the GetCurrentItem function, which is available at "Outlook VBA: Work with Open Item or Selected Item"
MsgBox "This only works with meetings." This variation of the macro from J. Frohberg above will remove all person's who declined the meeting. It checks all meetings in the Calendar. What I do is open the meeting request, click on follow, uncheck people's request to those who have accepted the meeting and send back the request meeting with a wording asking for answering. Are you removing users and sending an update? That will cancel it for the people you removed. How do you need the macro automated? Get Compile Error with "Set objItem = GetCurrentItem()" being highlighted in the error in visual basic screen. Hopefully this is a problem with Outlook 2016 using 365? It would be great to have a fix... very much appreciate you going out of your way to enlighten us... again thanks. Chip. Is it possible to get this as an Add-in in Outlook? As a macro it works so nice but i need it as a add-in. And you know maybe how to do this? This is sooo close to what I need but I cannot think of a way to tweak to for my needs... I am in charge of organizing meetings for my company (150+ people). However, depending on the conference room, there may only be space for a certain amount of people who accept meeting invitations (say 50ish people). But because the meetings are first come-first serve, once the room capacity is met I have to send individual emails to those who still accepted, but are now technically on a waiting list, alerting them to the fact there is no space left in the room. Is someone willing to please help me automate this? I thought of using an automated response rule based on subject line "meeting name" and "accepted", but cannot figure out how to delay sending the response until i have 50 "accepts" in a certain folder. It's not an unusual request, I'm surprised no one has figured out a good solution. So you are moving the accepts to a specific folder? A macro could watch the folder and count the number of messages then trigger an autoreply. Even if you weren't moving the replies, a macro could still count, using the subject. Not sure how error-proof it will be... The big thing will be missing a malformed subject or if someone replies with the same subject. Undercounting wouldn't be so bad - people on the wait list would fill in. The good news is that i have a working macro. It's based on the macro at https://www.slipstick.com/developer/fun-arrays-one-macro-many-replies/ - the possibly bad news - it stores the response count in the registry (in a corp environment, you might not have the permissions needed to write to it). You'd also need to update the macro with the meeting subject and room count each time you send a meeting request that needs limited. A first version of this macro is at count-room-size.txt. This is an itemadd macro that watches the inbox. Add the meeting subject and count to the arrSubject and arrRmSize, in the same spot for each. To test it you can accept a meeting (using a second account) then copy the acceptance and paste it in the inbox. This version uses a text file. The registry version might be faster. Is there anyway to use the forward meeting invite instead of just sending an email? That way if the recipients have misplaced the original invite, they can accept the notification. You can right click on it in the calendar and choose Forward. I do not want it like this. Please help asap. If you want all of the accepted together, and the declined together, you'll need to create arrays then write to the document. I don't have ant code samples that do that, unfortunately. I need them like these in a word document. I was able to creat and open a document and write Not Responded, Responded, Tentative into it. But the values am not able to. Please help. also i did in my program to show the status of email id's in a msgbox. Unfortunately when i send an invite to 600 people only 20 were shown in the msgbox. Looks like there is a limitation. is there any other way? It sounds like there is a character limit. Some of the dialogs have a limit of 256 characters. Are you using a msgbox or do you mean the To field? It might be possible to split the list into multiple messages.